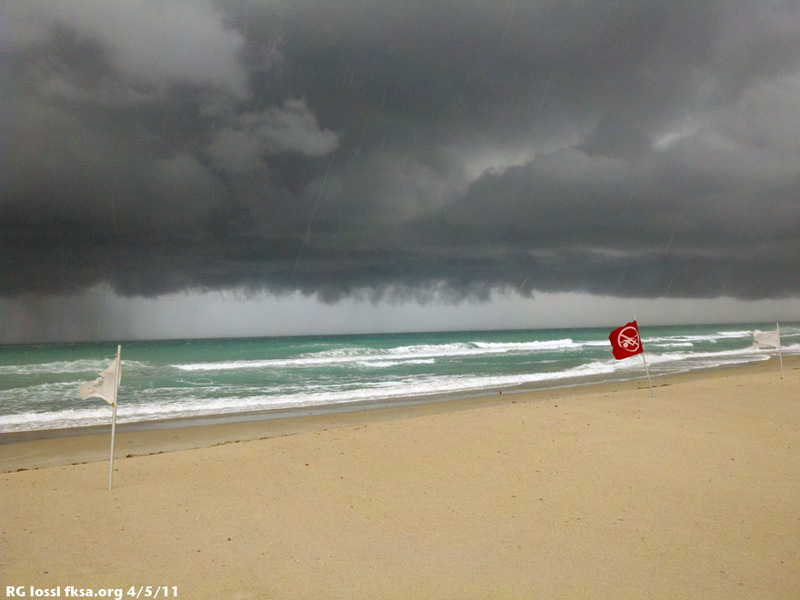 A shelf cloud in the squall line goes to sea, taking a kite but no kiter with it, this time. About 70% of kiter losses worldwide have occurred in high wind also including accidents in squalls in recent years. Over time riders have been lofted hundreds of feet, even 1700 ft. and 300 ft. high to hard collision, hundreds of feet into buildings, cars, trees, hitting sailboats and dying, being lofted and suffering permanent paralysis, dozens and dozens of them. Tragically most of these losses have been avoidable. Why would someone risk this in an obvious and avoidable threat? Could it be lack of understanding and/or respect for the hazard? 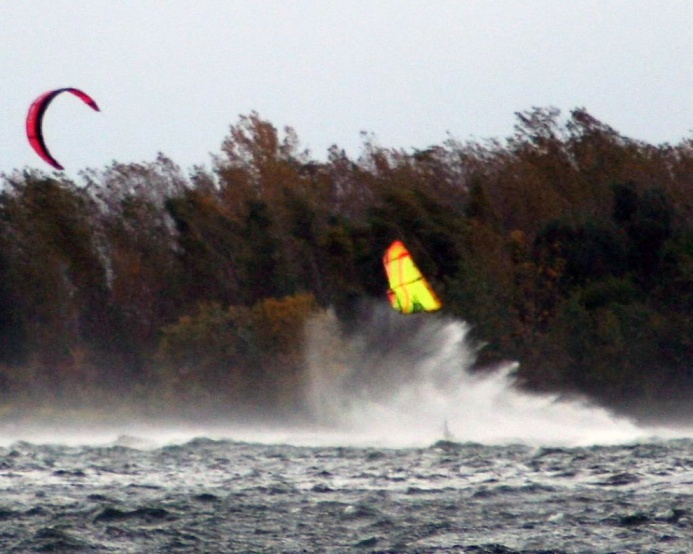 Despite this, kiters still go out intentionally in squalls and a percentage are harmed. It comes down to informed choice of course barring harm occurring to anyone else, still, it strikes me as a real bad idea from long personal experience. You can't guarantee others safety, including rescuers in such extreme events however or even the protection of our access. Our gear isn't designed for continuous riding in excessive winds and most don't even practice enough to realize what benefits our gear may offer in high wind emergencies despite that. A fools game to be frank looking over hundreds of accidents worldwide in the last thirteen years. 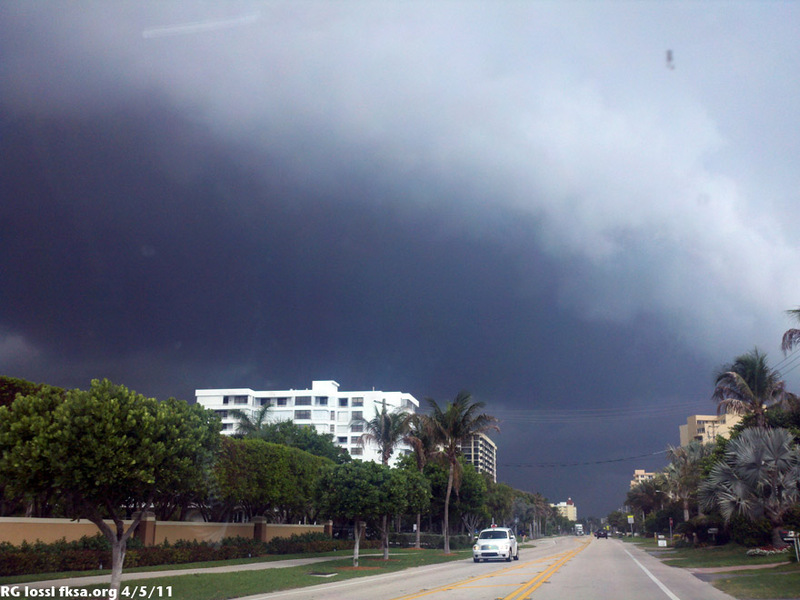 A shelf cloud rolls over Boca Raton, FL yesterday afternoon as the squall line rakes south down the state. Riders were out in some areas even as clouds looking like this approached? Bizarre, I believe we may be hard wired to try to avoid stuff like this from way back, yet some are still out there. Folks that mess around with these systems may not understand what they are getting into or respect it. Can't help with the reasoning part too much but I can at least share some information for consideration. 1. Pre-frontal squall lines are common with up to several a week moving through. They occur worldwide to my knowledge in varying frequencies. They represent the battle ground between two separate weather masses. So it is logical that strong storms, convection can be present at these junctures in the form of violent squall lines at times. 2. Violent, powerful squall lines seem to becoming more common, perhaps due to climate change? Lots of tornado's, bursts and related damage on the ground. - Realtime wind reports (through wind spikes, violent & near 90 degree direction changes) up weather. - Weather maps, with those frontal symbols and strong wind/storms warnings. 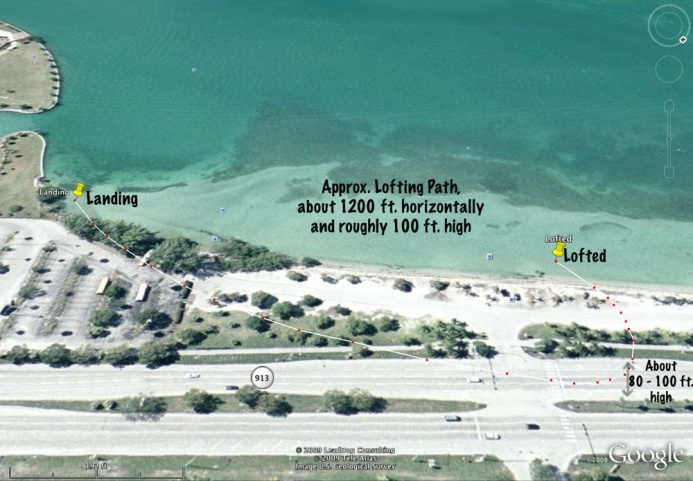 - To the naked eye at the beach although it is better to rely upon advanced warning provided by the above resources first and supplement with visual observations. 4. Squalls can move fast, over a mile a minute. In reduced visibility this means one could be on your in short minutes, not much time to react. They can be preceded by an advancing wind line, white water, blowing debris and obvious threatening clouds in some but not all cases. The temperature will drop, sometimes a lot, that is the air cascading down from 7 to 10 miles up smashing to earth in gust fronts. You could be comfortable before the arrival of the cold front and at risk of hypothermia if disabled after particularly in higher latitude storms in the cooler months. 5. Gust fronts may strike miles in advance of the squall cloud as can lightning. Squalls can also bring tornados, water spouts and microbursts. Microbursts can vomit winds to 170 mph over a couple of mile radius. Microbursts can be fairly common in such systems too as are tornados. These squalls can toss down hail too, some up to softball size. Getting whopped in the head with a good chunk of ice in free fall from miles up could take you out nicely, particularly with all that water to drown in. 6. Squalls may kill the wind entirely, boost it to hazardous levels or leave it unchanged. Sometimes it may drop the wind and then boost it dangerously. Quite a few kiters actually went in to rig larger kites only to go out in nuclear conditions when the storm clouds arrived. You can get an idea from what it has been doing upweather as to what it "may" do when it reaches you. It could be stronger or milder of course but it really pays to check out weather online upweather. 7. Squalls frequently cause the wind to change direction by about 90 degrees or violently change directions stalling kites. This can take reasonable side shore winds and shove them offshore. Kiters have been lost several times due to this predictable wind shift. Even more kites and boards have been lost. The wind shift happens even without squall lines with passage of "dry fronts" and can happen when regional winds take over at the end of the day from coastal "thermal winds" or sea breezes. 8. Riders hit with sudden high winds often fail to properly Emergency Depower their kites. Few practice it sufficiently to provide much assurance of success anyway. A great deal is riding on you doing what you need to do in very little time with everything working as intended in the midst of dangerous squall gusts. It hasn't worked out well for quite a few in the past. 9. Given the uncertainty of how things will work out in a squall the logical conclusion is to avoid it and by a good margin of time. Lightning, gust fronts can reach out well ahead and you never know if you might be slowed down in landing and securing. REGULARLY PRACTICE what you would do mentally and physically with kite, quick releases, etc.. in a high wind emergency just in case you really screwup and drop yourself in it despite strong efforts to avoid squalls. Most never bother to do this seriously and so may set themselves up for a real bad experience some unfortunate day. 10. Some say to go offshore in squalls to "ride it out like a bluewater ship." When was the last time you saw a ship lofted 300 ft.? I suspect this has never happened. The reasoning is that if you stay away from the hard stuff you will be OK. Reason and the accident experience don't support this. Instead get in early and secure. We aren't ships, not remotely close particularly in how high winds deal with us. A kiter, who survived, was lofted 1200 ft. in a 25 kt. squall gust?! How far offshore are you going to go? Also there was another kiter lofted off the water smashed to unconsciousness and near drowning in a 35 kts. squall gusts. The key to squalls is to NOT be in them and with time to spare, react early in other words. 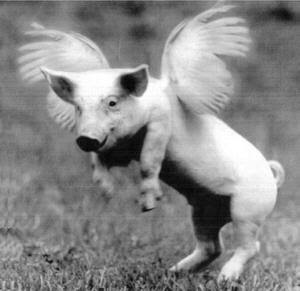 We may not see pigs (or ships!) fly but kiters can do it easily, worse to harm in excessive wind all too commonly. * Click for some ideas on kiting weather planning and monitoring, something ALL kiters should routinely do in my opinion. Don't mess with squalls, avoid them with a passion. Anticipate them, land and secure early. Secure ideally means to put your gear away. I saw a kite traveling offshore yesterday in a normal 90 degree wind shift, likely lost forever. If it had been rolled up, at least with the leading edge deflated and lines detached it might not have left the beach. Wait until signs indicate it is ok to go out again. Often there can be a post squall low, that effectively kills the wind anyway. It isn't that hard to do as a rule and the consequences of ignoring them can be dire. ** Wind Dumb - AJ used this term recently, I hadn't heard it before. I would assume it is the blurring normal judgment in the revels of wind lust. It allows us to go out into conditions we don't understand sufficiently or could reliably handle perhaps even if we understood them well. I think many of us may have been susceptible at some time, but a bit of knowledge and common sense will likely see you past it. If you think you can handle it, view the video at the link below and answer again if you know that you could or that it is worth your good health or life if not. This is a fairly extreme wind event, lots of kiters have been lost and maimed in substantially less, half even lower wind from squalls.